American Baptist Foundation was established in 1985 to provide estate planning and planned giving services and resources for the American Baptist family. Bill and Clara were talking to their attorney Susan about their family. Clara: "It may be time to start the inheritance process. Our children are now ages 35, 37 and 38. We might want to give them something during the next few years." Bill: "Susan, when we spoke by phone, you thought that we might consider a 'Wait A While' trust." Clara: "How does that work?" Bill: "Well, the trust is funded with property and pays a fixed amount to charity for a period of years." Susan: "We might think about a trust that pays for 12 years. You already make gifts to charity so we just would make those same gifts out of the trust. After 12 years, the trust will be distributed to the children. They will then be ages 47, 49 and 50." Clara: "That's probably a very good time to pass property to them. They may still have children in college and they also will be thinking seriously about investing for their future retirement." Bill: "Is this the right time to consider a 'Wait A While' trust?" Susan: "You have come at a good time. Your estate is continuing to grow, both of you have prepared very well for your retirement and this is a good time to think about this trust." Clara: "Is 12 years a typical length of time for this trust? As I understand the trust, our children will receive their inheritance after that period of time." Susan: "You may choose the time. Twelve years is a very good option. We can fund the trust with a fairly substantial amount so that there will be a good start to their inheritance at that time. When we fund the trust, there will be a requirement to file a gift tax return and use part of the gift exemption that each of you have. However, you won't actually have to pay any gift tax at that time. In addition, this may save future estate tax. While it's very difficult to know exactly what the estate tax picture will be like in the future, there is a good probability that there will be an estate tax and this trust will produce large tax savings." Bill: "Is this the primary reason to set up this lead trust? Our desire is to start planning for our children's inheritance." Susan: "It is a very good reason. Another reason is to help your favorite charities with the payouts for the 12 years." Clara: "I like the idea of starting the inheritance for children. With our growing estate, there will eventually be a larger distribution. By the time the children receive this first inheritance, they will be more mature. In addition, we'll still be here to offer advice and counsel." Bill: "We thought that we might start this with about $500,000. We have a portfolio of stocks and bonds that has grown over the years. With this amount and some potential growth in the trust, each of our three children would receive about $200,000 after the trust has made the 12 years of payments to charity." Susan: "A good idea is to transfer a securities portfolio that is comprised of around 60% stocks and 40% bonds. The bond income will be used first to pay the charities. With the bond income and stock dividends, we can take care of most of the payout. I suggest that the trust pay an annuity amount equal to 5% of the value. If you fund the trust with $500,000, then there would be $25,000 paid to charity each year. If we can earn more than 5% each year, the growth will be transferred to children at the end of 12 years." Clara: "This sounds like a very good idea. Bill, let's move forward and ask Susan to prepare the documents. I know that this will be great for our children and for our favorite charities." 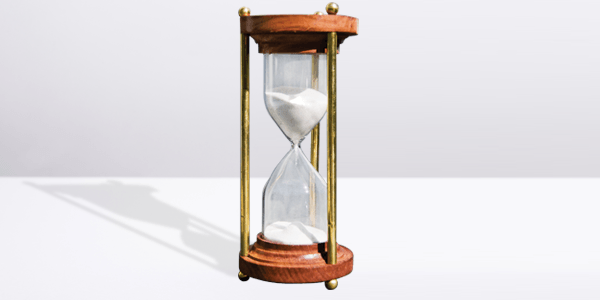 The "Wait A While" trust is called a charitable lead annuity trust. Bill and Clara plan to transfer $500,000 in stocks and bonds to the trust. Because it is an annuity trust, it pays an initial 5% of $500,000 or $25,000 fixed amount to the charity. Over a period of 12 years, the trust will pay $300,000 to charity. Bill and Clara may select the charities when the trust is created or they may permit children to select charities each year. While most donors select the charities, it's also permissible to allow children to select part or all of the charities to receive the distribution. The trust's stocks and bonds will continue to be invested. If the total return is 6.5%, it would grow to $630,000 over the 12 year period. Each of the three children would then receive approximately $210,000. The trust may be funded with appreciated property. When the children receive their initial inheritance, there may be appreciation. However, the children will have two easy solutions to avoid paying any capital gains tax. If they are making gifts to charity, they may retain their cash income and use the appreciated stocks to make their charitable gifts. This will bypass the capital gain. Alternatively, if they do wish to sell, they could sell part for cash and transfer the balance into a two-life charitable remainder unitrust. The charitable savings from the trust would offset the gain on the part sold and again there would be no capital gains tax paid by the children. Attorney Susan will file a Form 709 Gift Tax Return. She will report a gift of $500,000 with a charitable gift deduction of $245,000. There will be a taxable transfer of $255,000. However, this is significantly less than the $11.4 million gift exemption available to both Bill and Clara. Therefore, there will be no payment of gift tax now. Because the amount of the gift is fixed, if there is a substantial estate tax when Bill and Clara pass away, there will be added estate tax savings. The "Wait A While" trust is an excellent plan to start an inheritance. It allows Bill and Clara to continue to benefit favorite charities for a period of years and then transfer the principal to children or other family members. Their attorney Susan will file a gift tax return, but in virtually all cases there will be no gift tax payable because of the gift exemption. In all probability, the "Wait A While" trust will save a major future estate tax. Finally, it allows Bill and Clara to start an inheritance for the children and to give them advice and counsel on the best use of the funds.